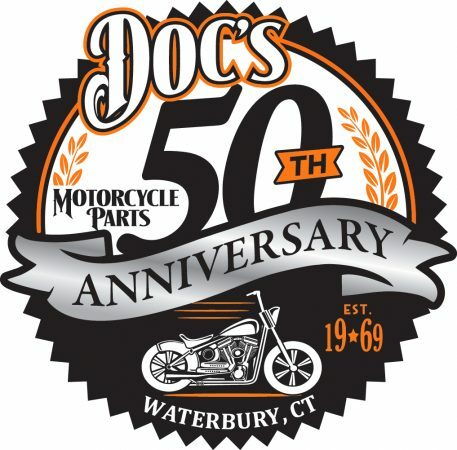 BARKHAMSTED, CT – Down a narrow, unpaved driveway and behind a house in Barkhamsted sits a weathered, nondescript garage that’s filled with relics worth marveling over – an assortment of classic cars and vintage motorcycles. Among the four-wheeled vehicles are two convertibles – a 1942 Ford and a 1954 Chevy. 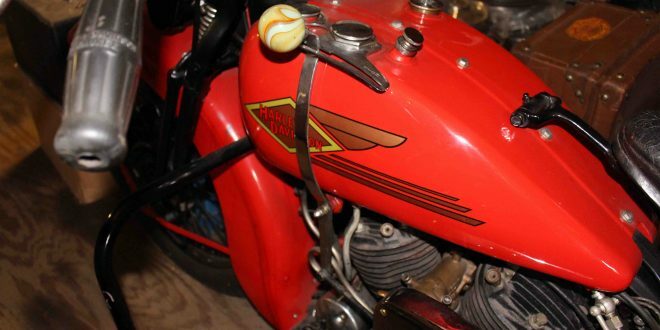 The collection belongs to Jim Fenn, whose favorite motorcycle is a blue 1954 Harley-Davidson FL. 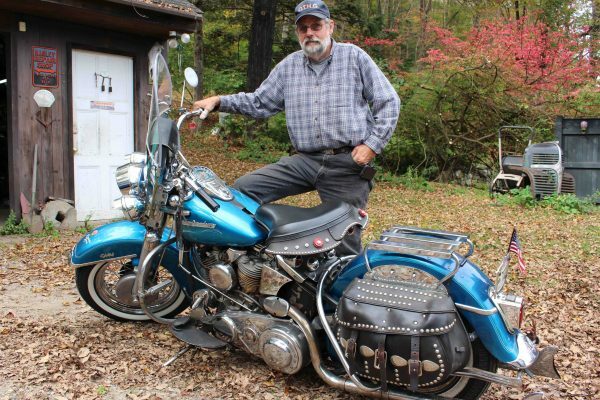 Fenn owns six bikes and has more old motorcycle parts than he can easily count. 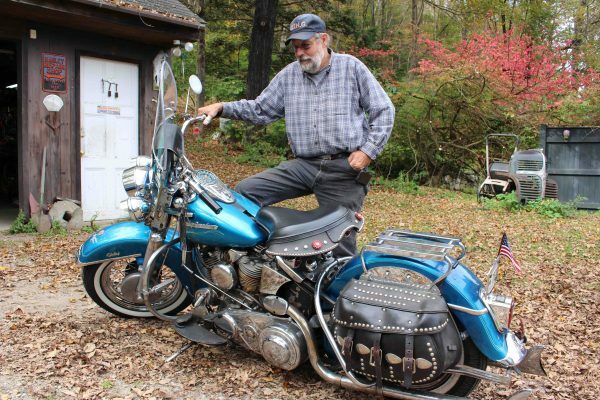 His newest model is a 1997 Harley-Davidson Ultra Classic and the oldest is a 1934 Harley-Davidson VLD (pictured at top). 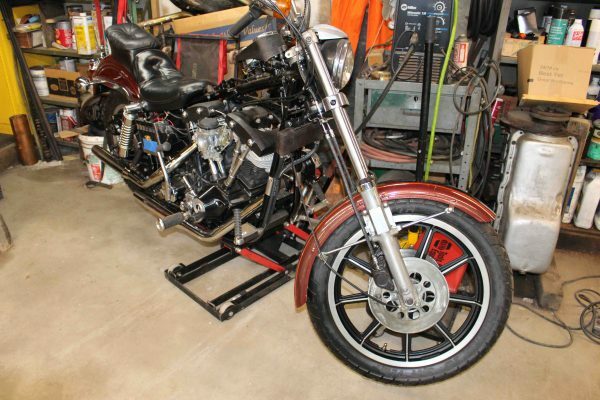 In-between are a 1942 Harley-Davidson FL, a 1968 Harley-Davidson FLH and a 1981 Harley-Davidson FXS Low Rider, which sits on a lift undergoing restoration. Fenn has owned the 1954 FL for 35 years. He traded a 1932 VL and handed over $800 to acquire it. He was seeking a four-speed transmission, the VL only having a three-speed, and “a little more power” at the time. Hindsight suggests that keeping the ’32 VL might have been a wiser move financially in the long-term. To a kidding suggestion that he didn’t consider the future value of the ’32 when he got rid of it, he replied somewhat resignedly, “Apparently not.” He can’t complain, though, having ended up with the beloved FL. Up close, the FL looks to be in good shape for its age, with white wall tires, windshield, solo seat, rear rack, saddlebags and a U.S. flag flying from the rear. Fenn said it usually starts on the first kick, but predicted that it wouldn’t be cooperative with a stranger looking on when he went to put it back inside. He was correct. It actually took a second kick for it to fire up. At the back of the garage’s first floor, the AMF-era Low Rider is in the middle of getting put back on the road. The tins are off, resting on a nearby table. 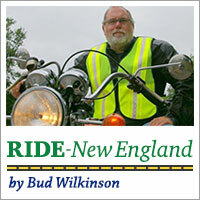 Fenn found the 36-year-old motorcycle in Winsted a little less than two years ago. It had been sitting outside “10 feet from a garage” for 27 years “according to the plate on it,” he said. 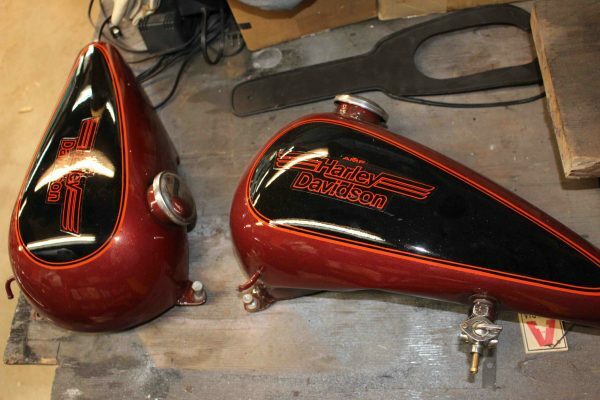 Surprisingly, the split gas tank cleaned up nicely to the point the black and red paint job with orange pin-striping didn’t have to be scrapped. A layer of clear-coat was all that was needed to make it glisten. “That was the best part of the whole bike. I wanted to maintain the original paint if I could,” he said. Elbow grease also helped bring back the luster of the shiny parts, but it has taken a lot of work. He hopes to have it roadworthy in the spring. The upstairs of Fenn’s garage is used for parts storage and to house three models – the red and black 1942 FL, the green 1968 FLH, and the red 1934 VLD, which he built “pretty much out of swap meet parts. 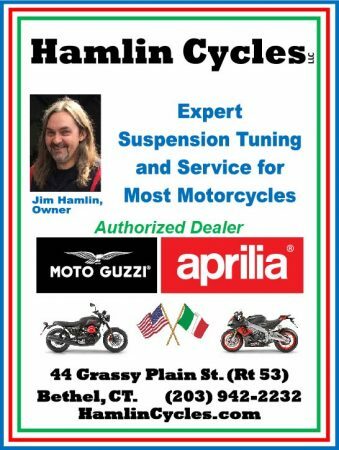 First you buy a manual, then you figure out what parts you have and what parts you need,” he explained. The VLD may never be finished, though. “I’m still collecting parts for that one; better parts than I have,” he said. 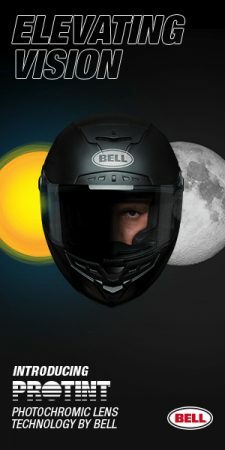 Just how many total motorcycle parts that he has in his inventory is a mystery. “I have no clue – a truckload or more,” he guessed. Fenn has been a life-long motorcycle lover and does all his own wrenching. “I always wanted a motorcycle. I wanted a motorcycle since I was four years old,” he said, noting that he yearned for Santa Claus to bring him one for Christmas. That didn’t happen, but when he was 12 he did spend $12 on a Whizzer motor. “I put it on a Columbia bicycle and never looked back,” he said. 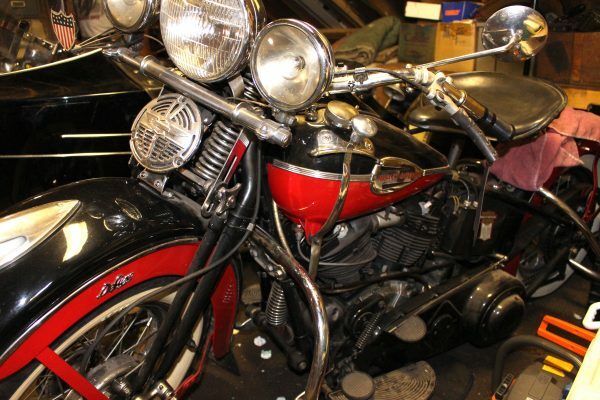 While there’s a skeleton of an old Honda rusting in the yard behind his garage, Fenn said he’s particular when it comes to motorcycle brands that he finds acceptable. “I’ve had a couple of Indians. 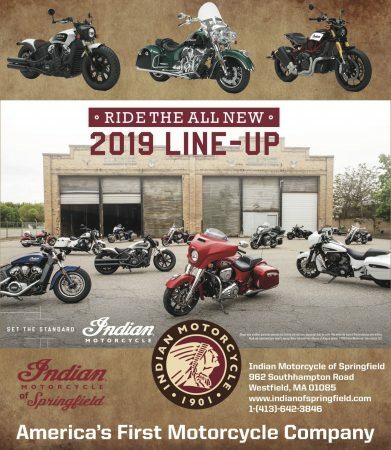 Indians and Harleys, that’s all I’ve ever owned,” he said. 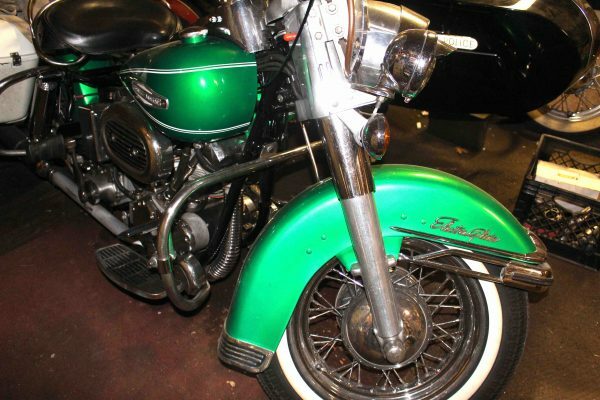 Fenn’s bikes do get noticed when they’re ridden, especially his preferred ’54 FL. “Everybody likes these old bikes. Everybody wants to buy it,” he said. Don’t look for him to part with his pride and joy. “I’m keeping this old bike,” he said.